Although I've been flat out with work lately, I did manage to squeeze a little scrapping in for the Scrap Pile Mothers' Day themed CC on Friday night. 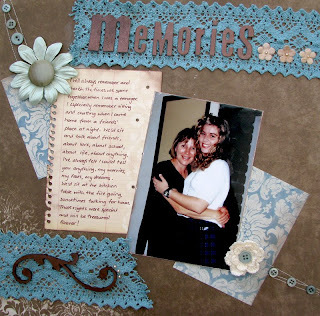 I designed a sketch and my challenge was to use the sketch as a base and scrap about a favourite Mother memory. I'm looking forward to scrapping some of the other challenges, as they looks like loads of fun. 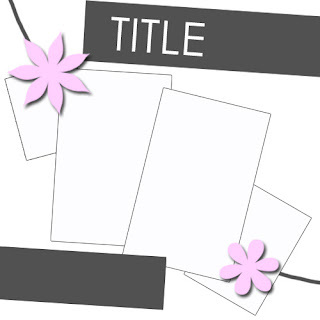 Deb's challenged us to make flowers from scraps, Jewls put a gorgeous flower card challenge forward and Melanie challenged us to make a heritage layout with pearls. A great opportunity to create some beauty for Mum on Mothers' Day! Hi Leah, loved your sketch and am hoping to make a start on it today.Have the photo, now just need to get the rest going.Thanks for a great night last Friday.